I have made a number of trips to Africa to hunt plains game over the years. After each trip there was a short period of satisfaction followed by a sudden longing to go back. One evening as I was watching a colorful sunset I started day dreaming about the red sands of Africa and the many friends that I have made there. I could almost feel the fingers of the Dark Continent reaching out to draw me back. I went inside and asked my wife Denise if she was ready to return and her answer was immediate … she looked me in the eye and said lets start planning. This time however, I wanted to take along some other family members and invited my Step-Son, Levi Hulsey to come along. The trip was to be his college graduation gift. When I told my daughter Brandy about the trip, she said she would like to give her husband a safari as a wedding anniversary gift. I thought it was a great idea and my Son-In-Law, Robert Smith was added to the group. For both Levi and Robert, it would be a first trip to the Dark Continent and I was sure it would be a great adventure. I made arrangements for us to hunt with Shona Hunting Adventures. I spoke with the owner of Shona and my friend, Johann Veldsman, and he promised to make the trip very special for Levi and Robert, who were both interested in taking large antelope trophies. We arrived at the Hosea Kutako International Airport (WDH) in Windhoek, the capital of Namibia, at 10:45am on August 6, 2012 where we were met by Willie Ilse who is an apprentice PH with Shona Hunting Adventures. After loading up, we traveled to Shona’s Tualuka Safari Lodge. This beautiful, five star lodge is located in the north western part of Namibia. It consists of 16,500 acres of privately owned land situated on the banks of the non-perennial HuabRiver. The area located in Kaokoland, in the Kunene Region and is part of the Loxodonta Africana Conservancy area and is rich with plains game. As promised, Johann and his staff lead Robert and Levi to the gold medal animals that they desired: Blue Wildebeest, Kudu, Gemsbok and a tremendous 14-ich Warthog that Johann and Levi worked at for three days. Since I had previously taken these animals for myself, I focused on Black Wildebeest, Impala and CapeEland. With our trophies in the salt, we all took a break from hunting and found ourselves talking about other hunting possibilities. Johann’s seven year old daughter Zoe was listening to the talks with interest. Zoe is a lovely little girl that quickly wins the hearts of all the hunting clients. She was born at Swakopmund on the Namibian coast but moved with her parents to the family’s hunting camps in Kaokland shortly after her birth. The first time I met Zoe, she was very shy and elusive. But with some effort, we became friends and enjoyed setting under a tent flap in the afternoons to talk to the birds. She knew them all by name and could mimic their every sound with precision. It was amazing to watch her do this. 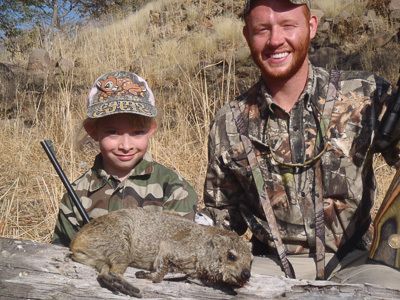 Hunting was a big part of Zoe’s life and her dad took her out hunting for small game with her petite, pink 22 caliber rifle. She was very familiar with safari routine and without realizing it, was becoming Africa’s youngest Professional Hunter in training. She had already become the camp’s unofficial social director. She enjoyed being around the clients and kept them entertained when they were not hunting. She has a bubbly laugh and you could not help but love her. Since the subject was on small game that evening, I pulled Johann aside and suggested that we allow Zoe to take Levi on a guided hunt for Dassies (Hyrax). There are hundreds of these small, stocky build creatures living in the rocky ridges surrounding Tualuka. Johann thought it was a great idea and Levi thought it would be fun. He was happy to help Zoe show her hunting skills. We then asked Zoe if she would like to guide a client on a hunt for pay and she jumped at the chance. That evening Zoe took Levi aside and instructed him on shot placement using a mounted Dassie that she had shot. In the morning she greeted her client, and with Dad in tow, started out on the great Dassie hunt. She led Levi to a dry river bed and pointed out a group of Dassies sunning in the rocks. They moved in slowly, trying hard not to spook the wary critters which always position themselves in a good vantage point high in the rocks. With their keen eye sight, hunting Dassies can be very challenging. The range was a little far and Levi’s first shot, using his 17 caliber rifle, was a miss. One shot is all you get. At the first sign of danger the Dassies dash for the safety of the many cracks and crevices in the rocks where they hide. With this group now hidden from view, Zoe led Levi to another Kopje where she spotted more Dassies. She moved in closer to this group and put up the sticks. She pointed out a large male that she wanted him to shoot and it all came together. The shot struck home and Zoe congratulated Levi and then led him up the ridge to find the trophy. She was brimming with pride when they found the Dassie dead on the rocks. .
After supervising the photo shoot, they walked back to camp to settle the details of the hunt. Levi gave her 20 American dollars for the hunt and 5 dollar tip for her services. She was all smiles having successfully completing her first safari. That little Dassie may have been the smallest trophy taken on our hunt, but it is the first memory that comes to mind when I look back upon it. That day is burned into everyone’s mind and was a thrill for all of us to take part in an event that will probably lead to the development of another outstanding African PH. If you get a chance to go to Namibia to hunt, look up Zoe for a small game hunt. She would love your business and will leave you with memories that will hang with you forever. Don Roxby has over 50 years of hunting experience and has hunted extensively in the lower Untied States, Canada, and Alaska. Don has recently expanded his hunting activities to include Africa where he enjoys hunting plains game.